This topic explains how BPL business processes support error handling. BPL provides fault handlers that allow your business process to throw and catch errors, and compensation handlers that allow your business process to specify how it recovers from errors by undoing the actions that led to the error condition. The first <trace> element generates the message before assign. The <assign> element tries to set SomeProperty equal to the expression 1/0. This attempt produces a divide-by-zero system error. 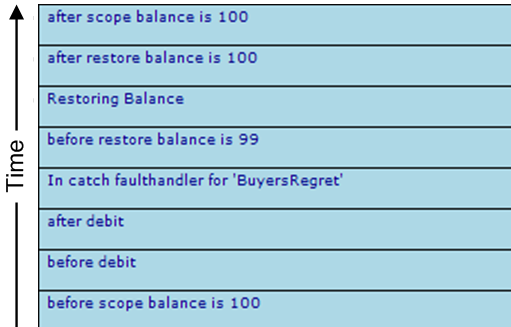 The business process ends and sends a message to the Event Log. The second <trace> element is never used. The corresponding Ensemble Event Log entries look like this. For background information, see the Event Log chapter in Managing Ensemble Productions. To enable error handling, BPL defines an element called <scope>. A scope is a wrapper for a set of activities. This scope may contain one or more activities, one or more fault handlers, and zero or more compensation handlers. 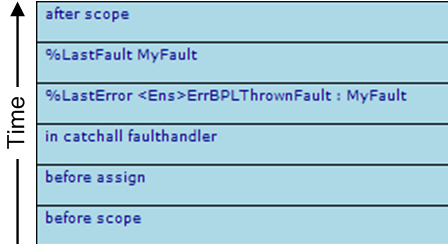 The fault handlers are intended to catch any errors that activities within the <scope> produce. The fault handlers may invoke compensation handlers to compensate for those errors. The following example provides a <scope> with a <faulthandlers> block that includes a <catchall>. Because the <scope> includes a <faulthandlers> element, the rectangle includes a horizontal dashed line across the middle; the area below this line displays the contents of the <faulthandlers>. The first <trace> element generates the message before scope. The <scope> element starts the scope. The second <trace> element generates the message before assign. The <assign> element tries to evaluate the expression 1/0. This attempt produces a divide-by-zero system error. Control now goes to the <faulthandlers> defined within the <scope>. The <scope> rectangle includes a horizontal dashed line across the middle; the area below this dashed line displays the contents of the <faulthandlers> element. In this case, there is no <catch>, but there is a <catchall> element, so control goes there. 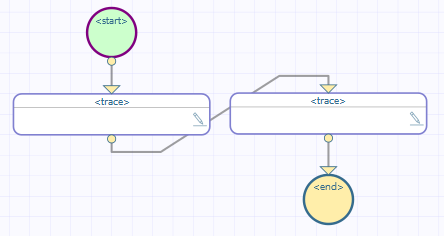 Note that Ensemble skips the <trace> element message immediately after the <assign> element. Within <catchall>, a <trace> element generates the message in catchall faulthandler. The last <trace> element generates the message after scope. The BPL context variable %LastError always contains a %Status value. If the error was an unexpected system error such as <UNDEF> this %Status value is created from the Error CacheError, which has code 5002, and the text of the $ZERROR special variable. To get the corresponding error code and text out of %LastError, use the $System.Status methods GetErrorCodes and GetOneStatusText, then concatenate them into a <trace> string, as shown above. When a <throw> statement executes, control immediately goes to the <faulthandlers> block inside the same <scope>, skipping all intervening statements after the <throw>. 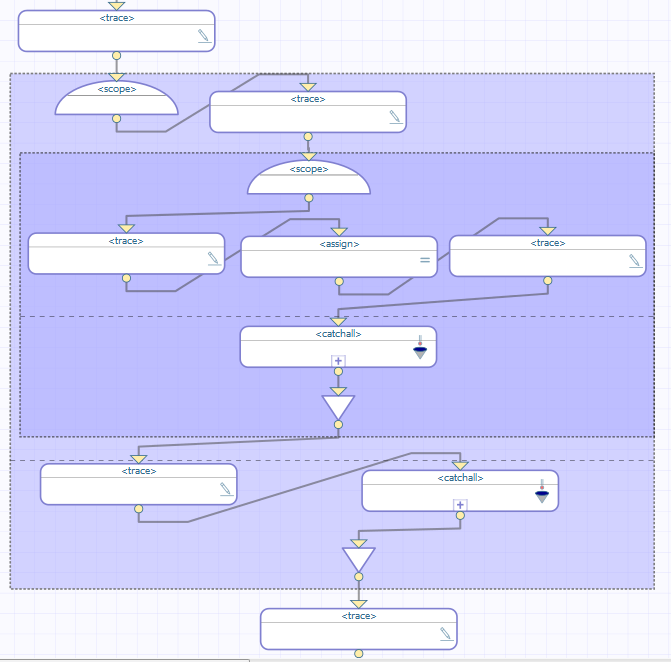 Inside the <faulthandlers> block, the program attempts to find a <catch> block whose value attribute matches the fault string expression in the <throw> statement. This comparison is case-sensitive. 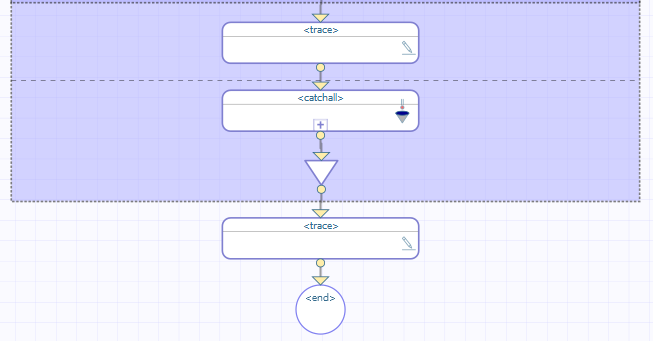 If there is a <catch> block that matches the fault, the program executes the code within this <catch> block and then exits the <scope>. The program resumes execution at the next statement following the closing </scope> element. If a fault is thrown, and the corresponding <faulthandlers> block contains no <catch> block that matches the fault string, control goes from the <throw> statement to the <catchall> block inside <faulthandlers>. After executing the contents of the <catchall> block, the program exits the <scope>. 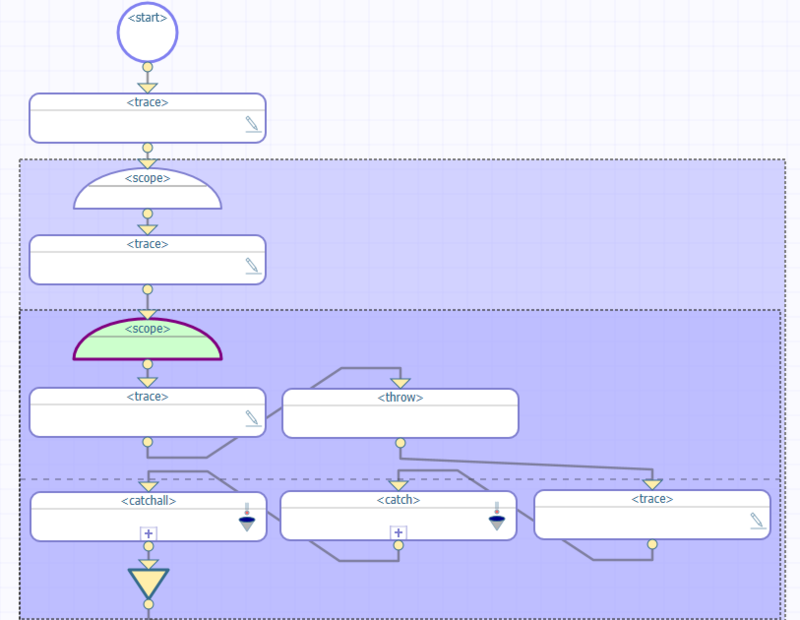 The program resumes execution at the next statement following the closing </scope> element. It is good programming practice to ensure that there is always a <catchall> block inside every <faulthandlers> block, to ensure that the program catches any unanticipated errors. Suppose you have the following BPL. For reasons of space, the <start> and <end> elements are not shown. The <throw> element throws a specific, named fault ("MyFault"). Control now goes to the <faulthandlers> defined within the <scope>. The <scope> rectangle includes a horizontal dashed line across the middle; the area below this dashed line displays the contents of the <faulthandlers> element. In this case, there is no <catch> but there is a <catchall> element, so control goes there. Note that Ensemble skips the third <trace> element. Within <catchall>, the first <trace> element generates the message in catchall faulthandler. Within <catchall>, the third <trace> element generates a message that provides information on the fault using the BPL context variable %LastFault. It contains the text derived from the fault expression from the <throw> statement. A thrown fault may reach a <catchall>, as in the previous example, or it may have a specific <catch>. The second <trace> element generates the message before throw. Control now goes to the <faulthandlers> defined within the <scope>. The <scope> rectangle includes a horizontal dashed line across the middle; the area below this dashed line displays the contents of the <faulthandlers> element. In this case, a <catch> element exists whose fault value is "MyFault", so control goes there. The <catchall> element is ignored. 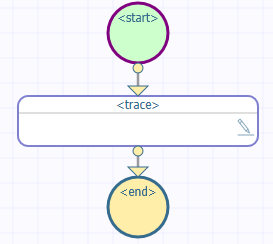 Note that Ensemble skips the <trace> element message after the <throw> element. 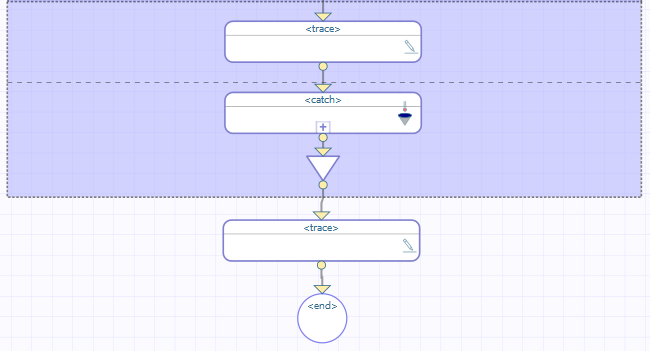 Within <catch>, the <trace> element generates the message in catch faulthandler for ‘MyFault’. It is possible to nest <scope> elements. An error or fault that occurs within the inner scope may be caught within the inner scope, or the inner scope may ignore the error and allow it to be caught by the <faulthandlers> block in the outer scope. The next several topics illustrate how BPL handles errors and faults that occur within an inner scope, when two or more scopes are nested. The first <trace> element generates the message before outer scope. The first <scope> element starts the outer scope. The second <trace> element generates the message in outer scope, before inner scope. The second <scope> element starts the inner scope. The next <trace> element generates the message in inner scope, before assign. Control now goes to the <faulthandlers> defined within the inner <scope>. This <scope> rectangle includes a horizontal dashed line across the middle; the area below this dashed line displays the contents of the <faulthandlers> element. In this case, there is no <catch> but there is a <catchall>, so control goes there. Note that Ensemble skips the <trace> element immediately after the <assign> element. Within this <catchall>, the <trace> element generates the message in inner scope, catchall. The next <trace> element generates the message in outer scope, after inner scope. The outer <scope> rectangle includes a horizontal dashed line across the middle; the area below this dashed line displays the contents of the <faulthandlers> element that contains a <catchall>. Because there is no fault, this <catchall> is ignored. The last <trace> element generates the message after outer scope. The next <trace> element generates the message in outer scope, before inner scope. Control now goes to the <faulthandlers> defined within the inner <scope>. This <scope> rectangle includes a horizontal dashed line across the middle; the area below this dashed line displays the contents of the <faulthandlers> element. In this case, a <catch> exists, but its fault value does not match the thrown fault. There is no <catchall> in the inner scope. Note that Ensemble skips the <trace> element that is immediately after <assign>. Control now goes to the <faulthandlers> block in the outer <scope>. 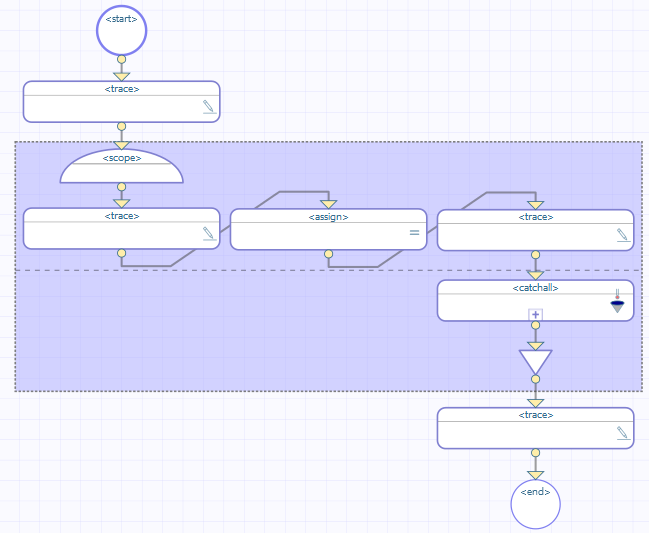 No <catch> matches the fault, but there is a <catchall> block. Control goes to this <catchall>. Within this <catchall>, the <trace> element generates the message in outer scope, catchall. Control now goes to the <faulthandlers> block in the inner <scope>. The <scope> rectangle includes a horizontal dashed line across the middle; the area below this dashed line displays the contents of the <faulthandlers> element. In this case, a <catch> exists, but its fault value does not match the thrown fault. There is no <catchall> in the inner scope. Control now goes to the <faulthandlers> block in the outer <scope>. No <catch> matches the fault, and there is no <catchall> block. The BPL immediately stops, sending a message to the Event Log. There is an important difference between this Event Log illustration and the one in the System Error with No Fault Handling example. The two examples have this in common: Each fails to provide adequate fault handling for the case when the divide-by-zero error occurs. The difference is that the System Error with No Fault Handling example has no <scope> and no <faulthandlers> block. Under these circumstances, Ensemble automatically outputs the system error to the Event Log, as shown in the first example. The current example is different because each <scope> does include a <faulthandlers> block. Under these circumstances, Ensemble does not automatically output the system error to the Event Log, as it did in the System Error with No Fault Handling example. It is up to the BPL business process developer to decide to output <trace> messages to the Event Log in case of an unexpected error. 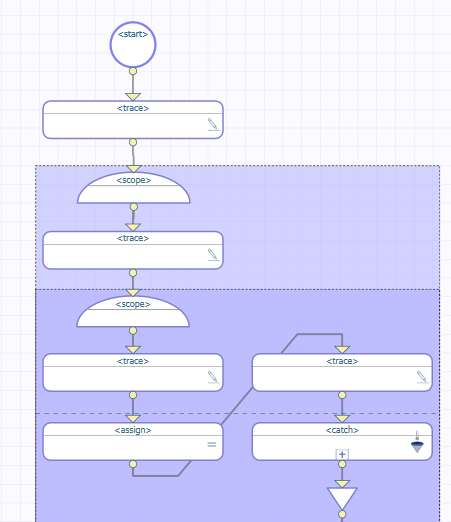 In the current example, no <faulthandlers> block catches the fault, so the only information that is traced regarding the system error is contained in the automatic message about business process termination (item 4 above). 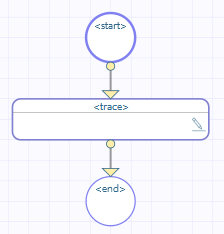 The next <trace> element generates the message in inner scope, before throw. Control now goes to the <faulthandlers> defined within the inner <scope>. A <catch> exists, but its fault value is "MismatchedFault". 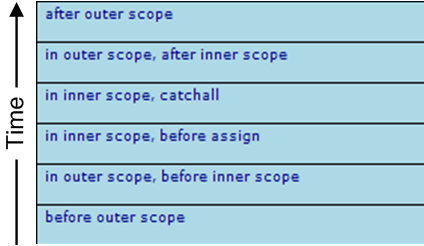 There is no <catchall> in the inner scope. Control goes to the <faulthandlers> block in the outer <scope>. It contains a <catch> whose fault value is "MyFault". The next <trace> element generates the message in outer scope catch faulthandler for 'MyFault'. In business process management, it is often necessary to reverse some segment of logic. This convention is known as compensation. The ruling principle is that if the business process does something, it must be able to undo it. That is, if a failure occurs, the business process must be able to compensate by undoing the action that failed. You need to be able to unroll all of the actions from that failure point back to the beginning, as if the problem action never occurred. BPL enables this with a mechanism called a compensation handler. Compensation handlers are only useful if you can undo the actions already performed. For example, if you transfer money into the wrong account, you can transfer it back again, but there are some actions that cannot be neatly undone. You must plan compensation handlers accordingly, and also organize them according to how far you want to roll things back. 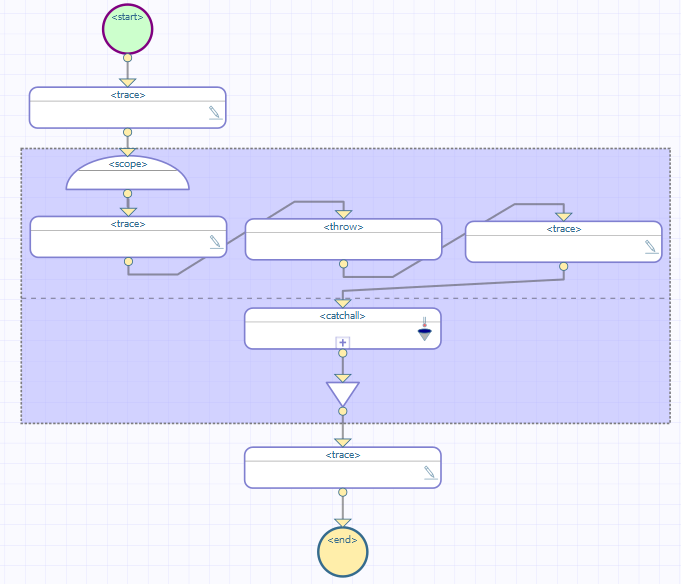 The Context tab (not shown) defines a property called MyBalance and sets its value to 100. 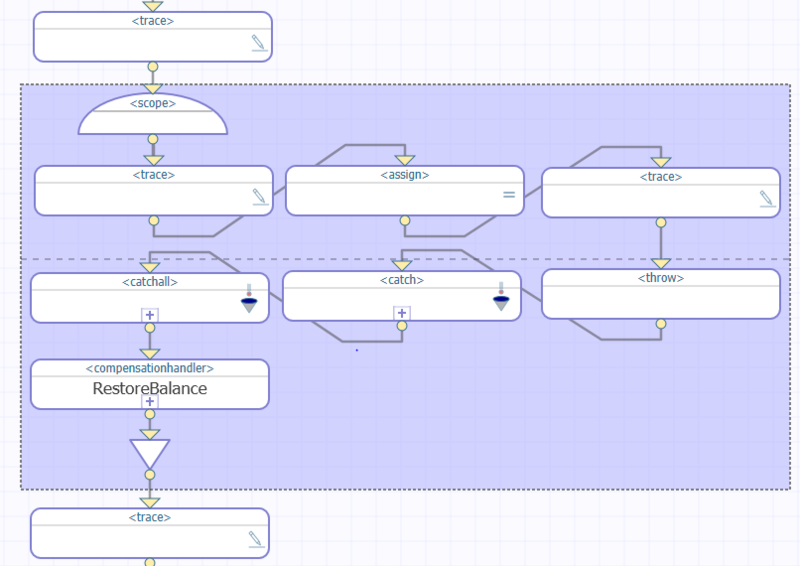 The first <trace> element generates the message before scope balance is, followed by the value of MyBalance. The next <trace> element generates the message before debit. 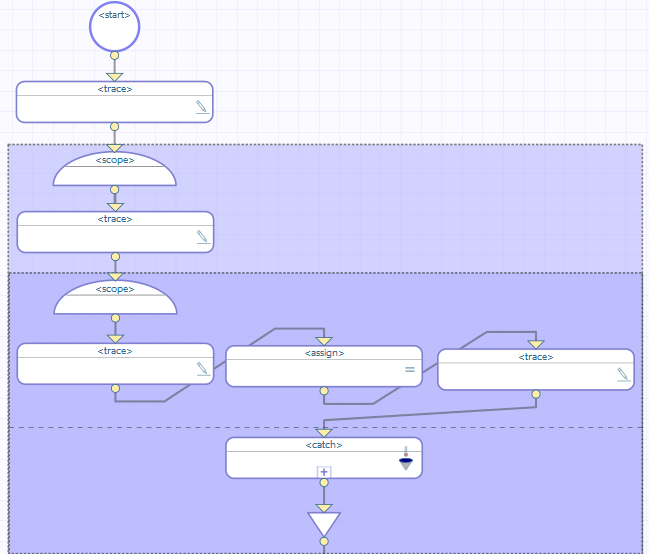 The <assign> element decrements MyBalance by 1. The next <trace> element generates the message after debit. The <throw> element throws a specific, named fault ("BuyersRegret"). Control now goes to the <faulthandlers>. A <catch> exists whose fault value is "BuyersRegret", so control goes there. Within this <catch>, the first <trace> element generates the message in catch faulthandler for 'BuyersRegret'. Within this <catch>, the second <trace> element generates the message before restore balance is, followed by the current value of MyBalance. 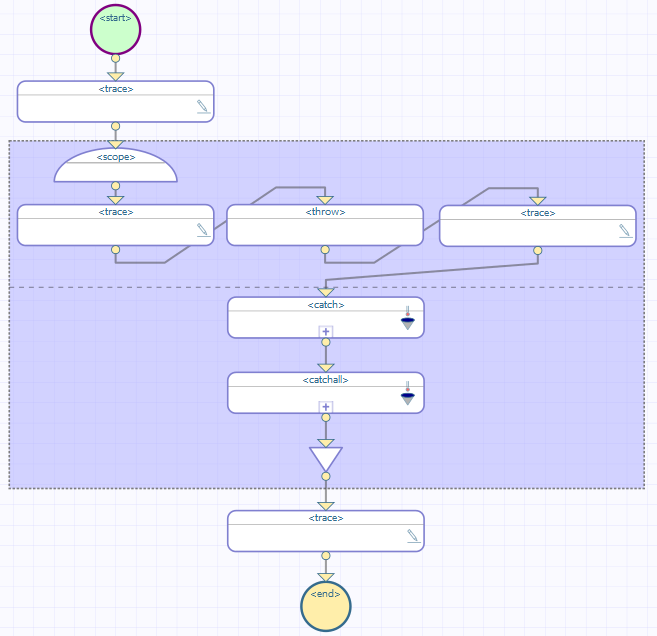 An <assign> statement increments MyBalance by 1. It is not possible to reverse the order of <compensationhandlers> and <faulthandlers>. If both blocks are provided, <compensationhandlers> must appear first and <faulthandlers> second. 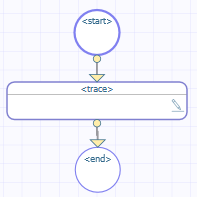 The next <trace> element generates the message after restore balance is, followed by the current value of MyBalance. 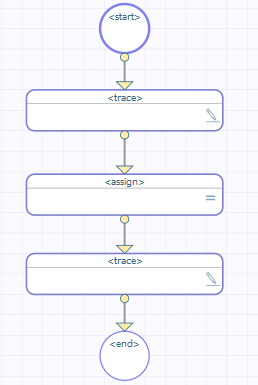 The last <trace> element generates the message after scope balance is, followed by the current value of MyBalance.